Examine the meaning of Lent and its significance in spiritual formation and the preparation for Easter, and walk through the holy season of Easter. Leading North American spiritual writers reflect on what one theologian has called the "bright sadness" of Lent: that it is not about feeling of broken and lost, but about cleansing the palate so we can taste life to a greater extent. In the Lent and Easter seasons, we encounter the God who, in all of life, is for us--for our liberation, for our healing, for our wholeness. Even in death we can find resurrection. 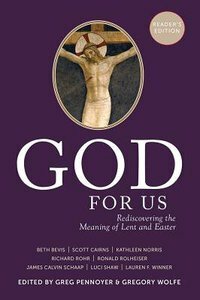 About "God For Us: Rediscovering the Meaning of Lent and Easter (Reader's Edition)"